Holiday bungalow for up to 4 people with garden. - The living area invites you to linger with a comfortable sofa set. Equipped with TV (SAT-TV), DVD player, board games, books, etc ..
Our house is privately run and is also used by us, so it lacks the guest at nothing. The holiday home also has its own beautiful garden. With us you feel well, you will miss nothing. 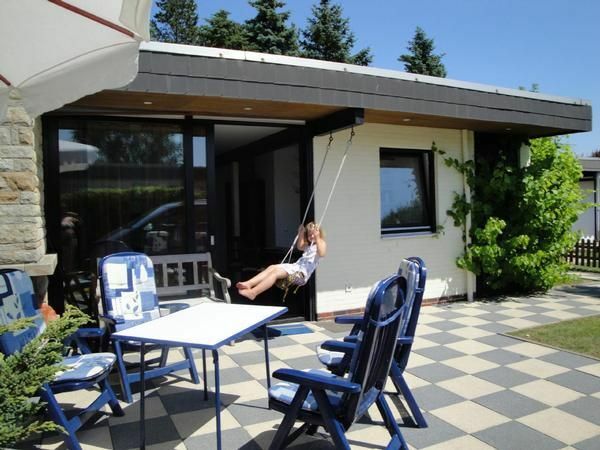 Our holiday park is located directly on the dike, you can reach the beach in just 5 minutes. Bakers, restaurants and shops within a few minutes walk. Overcrowding with a child up to 2 years possible. - Final cleaning: once per object costs in the amount of 45 EUR (compulsory). - Towels: per object and day to bring by the tenant (compulsory). - Local tax / tourist tax: per person and day costs of 0.95 EUR (obligatory). Linen (once per person, available 10 EUR). Tourist tax (per person and day to be carried by the renter 2. 3 EUR). Parking (per object and day, included in the price 0 EUR).